Who made you on YouTube? AC/DC give it all they've got, right? Of course they do. Well, now it's your chance, and if you're lucky, and if you truly give it all you've got, you could be a big winner. You could win a Gibson Angus Young Signature SG model hand-signed by AC/DC or a Gretsch G6131MY Malcolm Young Signature model also signed by the band. Pretty cool, huh? You could also become a YouTube star.Here's what you do: Get out the video camera and set the scene. 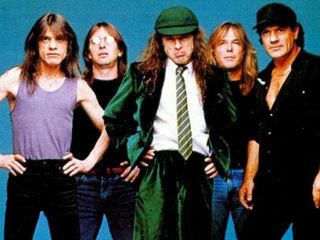 Next, record your own version of the brand-new AC/DC anthem Rock 'N Roll Train in any style you want - karaoke or piano, electric guitar through a Marshall amp or air guitar on your front porch. Anything goes!. Finally, add your video by following the steps outlined on our Give It All You Got contest page and keep checking back to see your competition as the days roll on. You might have to beat this guy, who posted this incredible video. Or you might have to outdo this dude, who certainly gave it all he had in this video. Oh, so you think you're better than them?. Prove it! And how about sending us some videos while you're at it.